Michael Spehar, center, helps eighth-graders Gerek Evans, left, and Imani Pelton plant native plants around a wetlands-type stormwater filtration and drainage system behind the Four Squares Business Center. 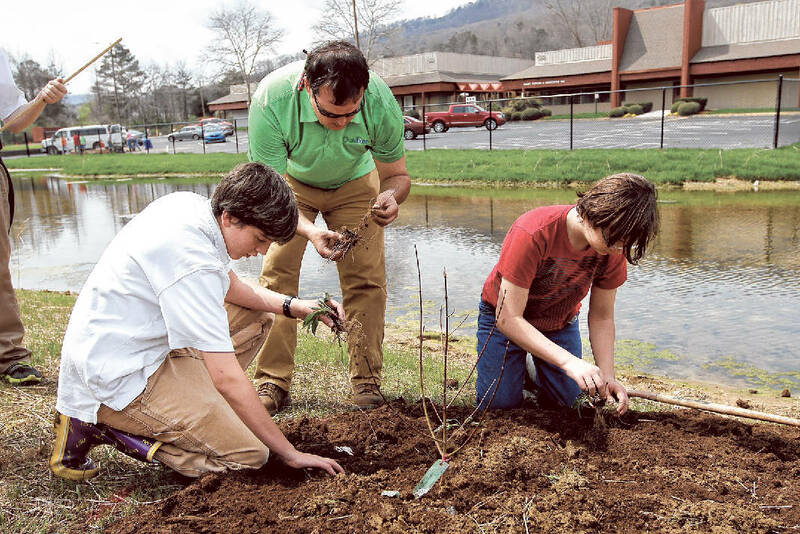 Students from Skyuka Hall planted native bushes and plants around the wetlands pond to attract butterflies, particularly endangered monarchs, and improve the quality of the water. Thousands of endangered monarch butterflies migrate through the southeastern United States each year. They depart from a mountain in Mexico and undertake a 3,000-mile, four-generation journey to Canada. This spring, a small wetlands behind a school in Red Bank will provide a resting spot for these insects. Students at Skyuka Hall spent Thursday afternoon preparing for the butterflies by planting bright orange milkweed, which is the only plant where monarchs choose to lay their eggs. "We should have butterflies coming through the wetlands soon," said Mary Beth Sutton, who is the executive director of Caribbean SEA [Student Environmental Alliance], and the organizer of this project. "The kids and I are so excited and have been working hard for this." The wetlands is a manmade stormwater treatment system, an environmentally friendly way to treat the dirty stormwater that runs off the roof of the school and across the parking lot. 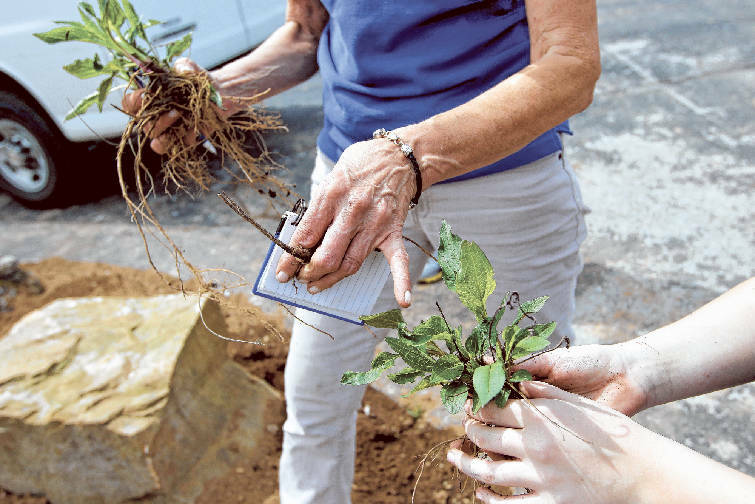 Tennessee Aquarium botanist Christine Bock has students write the names of the plants they are planting around a wetlands-type stormwater filtration and drainage system behind the Four Squares Business Center. Students and teachers at Skyuka Hall, a small private school for children who face academic challenges, have been working with Sutton for four years on the project. "Wetlands are known for being really good and filtering out waste," Sutton said. "But we also came up with all sorts of learning functions, which wetlands can also be." Josh Yoder, Skyuka Hall's head of school, said this project has energized the school's science curriculum. The students have been involved in each stage of building the wetlands. They helped Sutton with the design, and measured the current of Mountain Creek, which runs behind the school and receives the filtered stormwater. They helped bring in native plants, and have been observing the changes in the environment. "Constructing the wetlands makes science fun," Yoder said. "It's so much more than sitting behind a table and learning facts." Bill Raines is the owner of the Four Square Business Center where Skyuka Hall and the wetlands are located. He said that when he was approached by Sutton about the possibility of constructing the wetlands, he saw an opportunity to help educate children, clean the water and receive a tax break. The city of Chattanooga is offering him an 85 percent reduction in his water quality fee because of the wetlands on his property. Raines said he hopes more businesses will take advantage of the economic benefits of building wetlands, and that the local government will continue to offer economic incentives for them to do so. "The economic discount was just the icing on the cake," Raines said. "This will be like an outdoor laboratory that these kids will be able to continue utilizing." Everyone who has been involved in building the wetlands agrees that this is a long-term project, and the benefits of the filtration system and animal habitat will continue well into the future. "The kids can monitor the wildlife throughout the year," Sutton said. "As the wetland ages it becomes more diverse and will see more and more animals here."